Alongside with Vorarlberg and Tyrol, the south of Salzburg provides the best skiing areas of Austria. Many ski resorts are famous all over the world and through major skiing competitions, Austria′s reputation for skiing is spread even further. In Salzburg, this is particularly pronounced: Almost every child learns how to ski at latest at school. 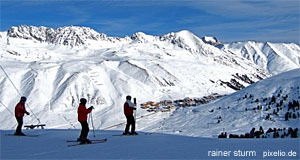 Skiing tourism is a major source of income for the Alpine regions. The skiing areas of Salzburg were in the poorest regions of the province until WWII - since the rise of skiing tourism, they are among the richest. Charter flights to Salzburg airport carry international tourists to the country, shuttle services such as the Snow Shuttle bus links the capital with skiing towns. Therefore, even tourists on sightseeing trips can easily escape to the mountains for some skiing if they want - ski rental companies take care of the gear. But what are the good skiing regions of Salzburg? In the following, you find a list of skiing areas in Salzburg. In addition, please note our articles on the southern parts of Salzburg province; and those mentioned in the topic box below. Note also our alphabetical list of all Salzburg ski resorts.